Streamflow, or channel runoff, is the flow of water in streams, rivers, and other channels, and is a major element of the water cycle. It is one component of the runoff of water from the land to water bodies, the other component being surface runoff. Water flowing in channels comes from surface runoff from adjacent hillslopes, from groundwater flow out of the ground, and from water discharged from pipes. The discharge of water flowing in a channel is measured using stream gauges. The record of flow over time is called a hydrograph. Flooding occurs when the volume of water exceeds the capacity of the channel. There are a variety of ways to measure the discharge of a stream or canal. For purposes that do not require a continuous measurement of stream flow over time, you can install current meters or weirs for small streams (a few meters wide or smaller). Basic stream analysis Analysis of stream flows involves mapping the habitat adjacent to the stream, preparing a cross section of the stream environment in a number of locations, and taking measurements of the area of the stream subject to flooding and measurements of the stream bed. Discharge is the volume of water moving down a stream or river per unit of time, commonly expressed in cubic meters per second. In general, river discharge is calculated by multiplying the area of water in a channel cross section by the average velocity of the water in that cross section. 1. Select a section of the stream/river that is moderately fast flowing. Select a site that is safe to take measurements across the stream and to survey up and down stream for about 50 meters. Establish a permanent benchmark at your study site. 2. At the benchmark, map a cross-sectional profile of the stream basin including the riparian zone. Stretch a measuring tape across the riparian zone you are mapping. Make sure the tape is level and is perpendicular to the stream flow. Measure the distance from the tape to the ground at regular intervals along the tape. Map the depth to either dry land or stream bottom. The divisions at the stream will differ from those used to map the valley profile. The stream width should be divided into 10 equal sized columns. 3. Stream volume is calculated by dividing the stream into 10 columns of water and calculating the flow in each column. Measure the average depth for each column and the width of each column. Calculate the cross section for each column. Calculate the flow rate for each column. Flow rates can be calculated by timing an orange moving a given distance in each column. This provides a flow in meters per second for each column. A flow meter also can be used to determine the velocity of the water. Measure stream velocity five or more times for each of the columns across the stream and take the average of the velocities. A variety of flow meters are commercially available or your team may want to construct and calibrate your own using a model boat propeller, a bike odometer, a small rare earth magnet and aluminum tubing. (Check out the tools and resources section for instructions on how to build you own flow meter). Calculate the volume of water for each column by multiplying the column cross section by the flow rate. Add all of the volumes together to find the total volume of stream flow. A second method for calculating stream flow is to use a "V" notch weir. A weir is an overflow dam used to alter the flow characteristics of a river or stream. In most cases weirs take the form of a barrier across the river that causes water to pool behind the structure (not unlike a dam), but allows water to flow over the top. Weirs give hydrologists and engineers a simple method of measuring the volumetric flow rate in small to medium-sized streams, or in industrial discharge locations. Since the geometry of the top of the weir is known, and all water flows over the weir, the depth of water behind the weir can be converted to a rate of flow. Triangular or V-notched weirs measure low discharges more accurately than horizontal weirs. The V-notch is most commonly a 90° opening with the sides of the notch inclined 45° with the vertical. Since the V-notch weir has no crest length, much smaller flows are represented by a given head than for a rectangular weir. For example, at a head of 5 cm, the discharge through a 30 cm rectangular weir with end contraction would be about six times that through a 90° V-notch. 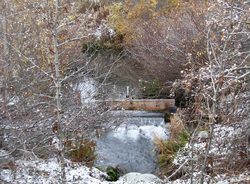 Stream flow may also be calculated by measuring the height of the water flowing over a "V" notch weir. A "V" notch weir may be cut to fit a culvert outlet and bolted to brackets attached to the culvert. The weir can be removed when the flow calculations have been completed. V-notch weirs should be used when low flows occur frequently and need to be included in the overall range to be measured.